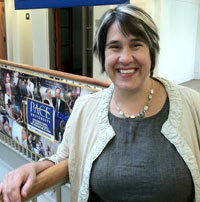 The Seidenberg School extends a warm welcome to Pam Yosh, its new Director of Development. Pam comes to us from SUNY New Paltz where she has served as an individual gifts officer. She replaces Dawn Rigney who has assumed the newly created position of Executive Director of Alumni Relations and Annual Giving for the University. While at SUNY New Paltz, she worked closely with the College of Liberal Arts and Sciences, the School of Fine Performing Arts and the School of Business. Pam has experience in many areas of development and alumni relations including major gifts, reunion giving, planned giving, donor events, and working with boards of directors. Before SUNY New Paltz, she worked with New York Medical College, the ALS Association Greater New York Chapter, and Massachusetts General Hospital. Pam received both her MS in Management Communication and BS in Advertising and Public Relations from Emerson College in Boston, MA. Congratulations! Hope all is well.